Do you know how visitors use your blog? I have previously reviewed Crazy Egg, whose heat maps and link tracking are exceptional (and easy to use). But a few weeks ago I signed up for a trial of Israeli company ClickTale, and I am absolutely blown away by what it can do. ClickTale records every “nth” visitor (you decide ratio) to your site, and then records each of their additional visitor sessions. This is a great way to learn how users’ behavior on your site changes over time. ClickTale plays back the scrolling, mouse movements and mouse clicks of your Web site visitors, proving you “movies” that show precisely how visitors are moving through the site. Are they even seeing that navigation? When do they look at the RSS feed button? It’s equal parts amazing, and eerie. The data collected by ClickTale is spectacular. Date of the visit. IP address of the visitor. Country of origin. Referrer. Landing page. Time spent. Engagement Time (which ClickTale trademarked, and total up the amount of time the visitor was clicking or moving the mouse). Number of pages viewed. This is incredibly powerful, as it blends Web site analytics and Web site usability in a natural and complementary way. I don’t do a lot of landing page testing these days, but if I did, I would be using ClickTale about 8 hours a day. Your Blog Post: Boring or Brilliant? Is the blog post too long? Too short? Is the thesis buried? Does anyone actually read this stuff? 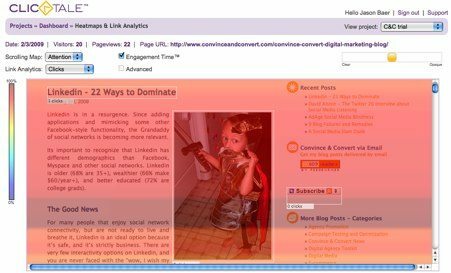 ClickTale answers those questions with its amazing scrolling heat map functions. ClickTale recorded 20 separate visitors on February 3, when my “Linkedin: 22 Ways to Dominate” post was on the top of this blog. According to the scrolling heat map report, 10 visitors (50%) made it all the way to the bottom – not bad for a very long post. Interestingly, none of the recorded visitors clicked on the actual slide presentation embedded in the post. 7 visitors made it down to the next post (interview with David Alston). In looking at the stats for a post the prior week about redesigns to this blog, the percentage of visitors making it to the bottom is similar, but the attention time is much lower – showing that post was mostly scanned, not read with the intensity of the Linkedin post. Note that ClickTale heat maps are one-dimensional. They track the vertical movement of the page as it is scrolled. They do not track lateral mouse movement, like classic heat maps do. 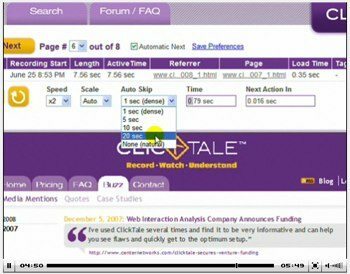 However, ClickTale does capture clicks, as well as “hover time” – how long the visitor paused over the link before deciding to click. Cool! ClickTale can also provide form analytics, to determine which fields in your Web form are getting skipped, how long it takes users to fill them out, etc. Very useful in a usability testing scenario. Considering what it can tell you about your audience, ClickTale is a bargain. Most bloggers can work within the constraints of the free program that tracks 400 page views per month. This site is getting about 6,000 visits/month, so I’m tracking about every 15th visit. The bronze package includes 20,000 page views recorded and should be sufficient for most sites, landing pages, etc. On an annual contract, it’s $59/month.